Not the kind of late where I keep people standing in the street for an hour or two. But I’m consistently 15 minutes late. I seem to always underestimate the time things take to do, or more specifically, I tend to get involved with things that distract me from getting to where I need to go. It’s the same with blogging. I have a calendar. I’m cognizant of when I should be posting things. But then… y’know… shiny objects. 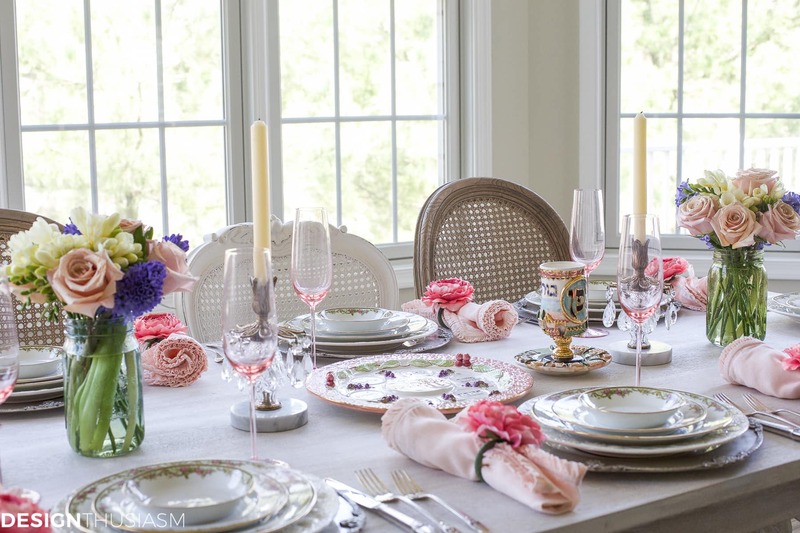 So while everyone else has moved on to summer, I’m still posting spring table settings. Worse, today’s tablescape would’ve been perfect inspiration for Easter. The week AFTER Easter. 15 minutes late. To be fair, this table was my Passover table and it IS still Passover. 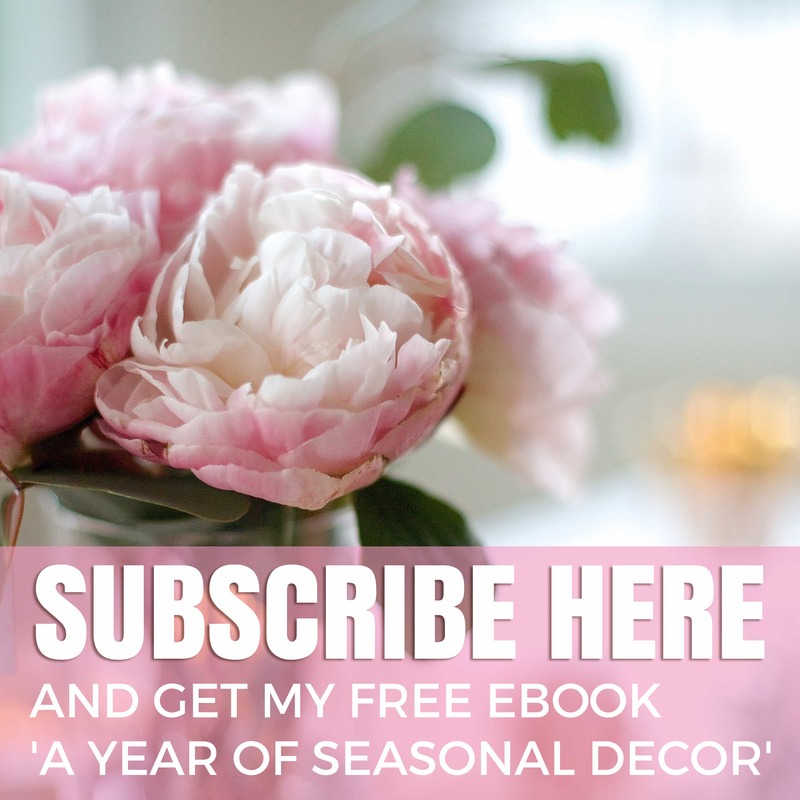 But because my goal is to inspire you to use these ideas in ways that work for you, let’s talk about May and the sweet occasions for entertaining that are upcoming. 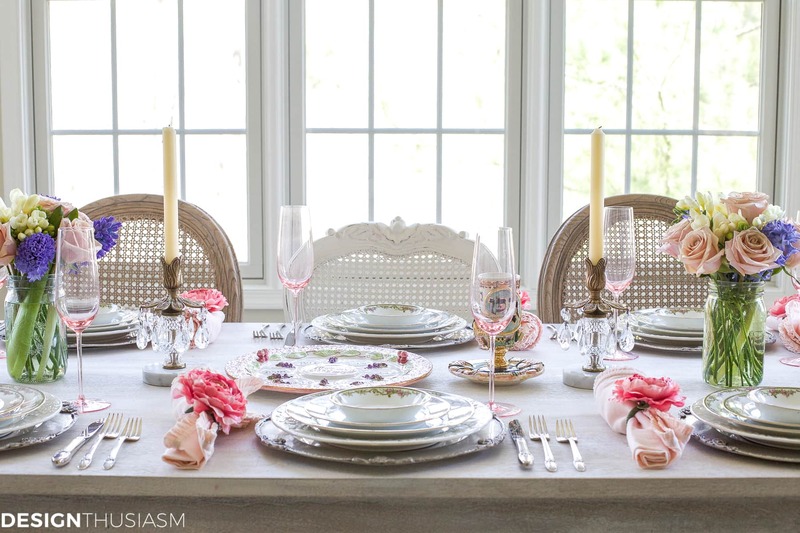 Today I’m joining with my blogger friends from the “It’s All Set” tablescape group to bring you this month’s edition of our series. 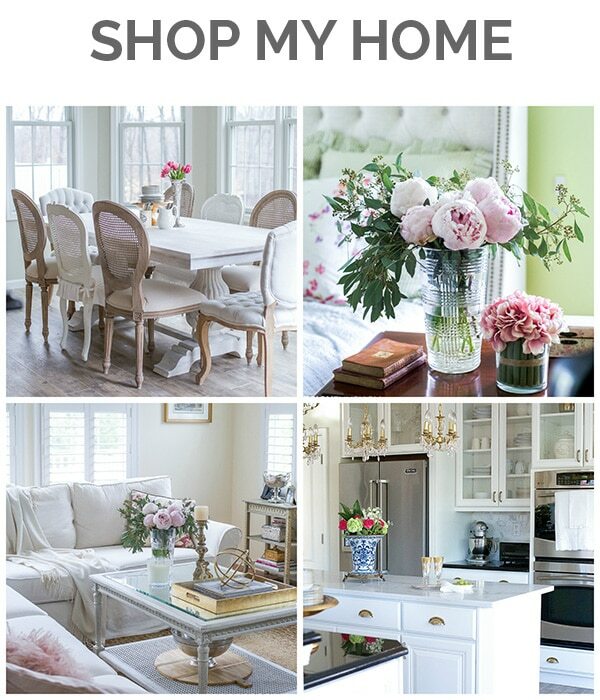 Be sure to visit the other beautiful tables linked at the bottom of this post! 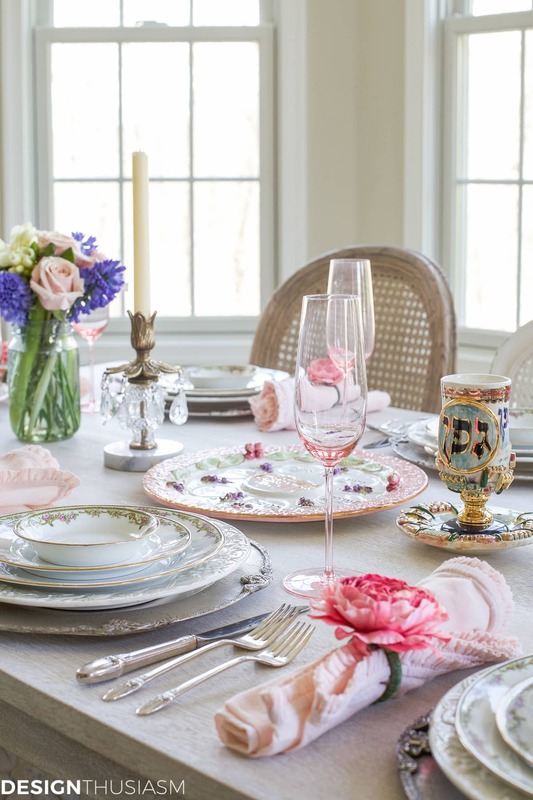 The customary greeting at Passover is to wish friends and family a sweet Passover. 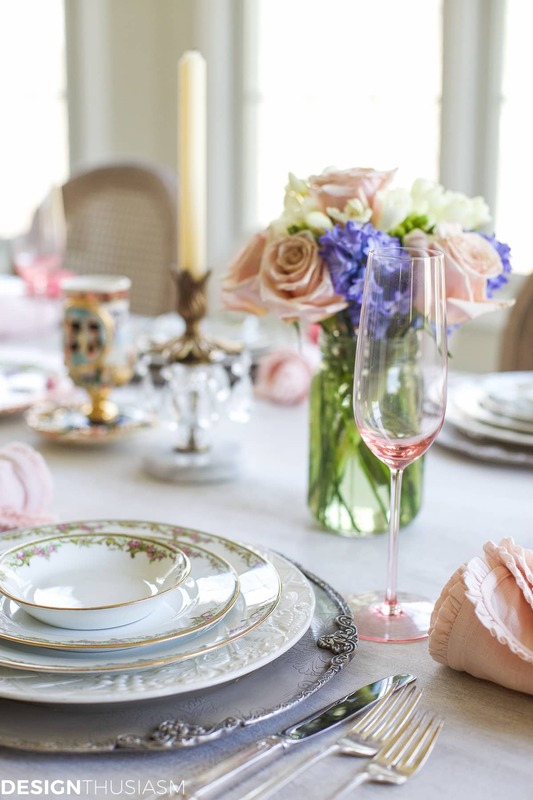 I chose this as the launching point for my color palette, selecting gentle pastels in blush pink, pale yellow and pretty lilac, combined to deliver a spring table that is subtle in its sweetness, like an elegant confection. 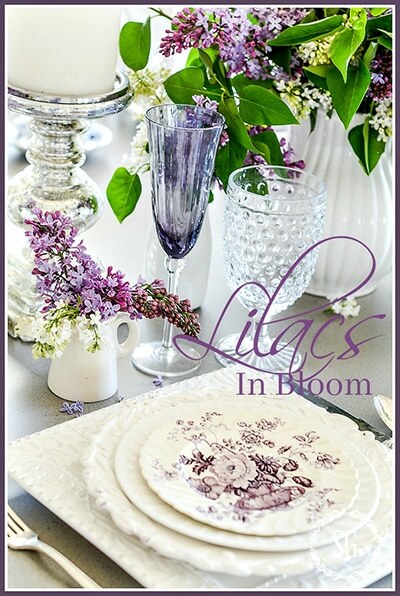 The color feeling would also work well for Mother’s Day or an early summer bridal shower. 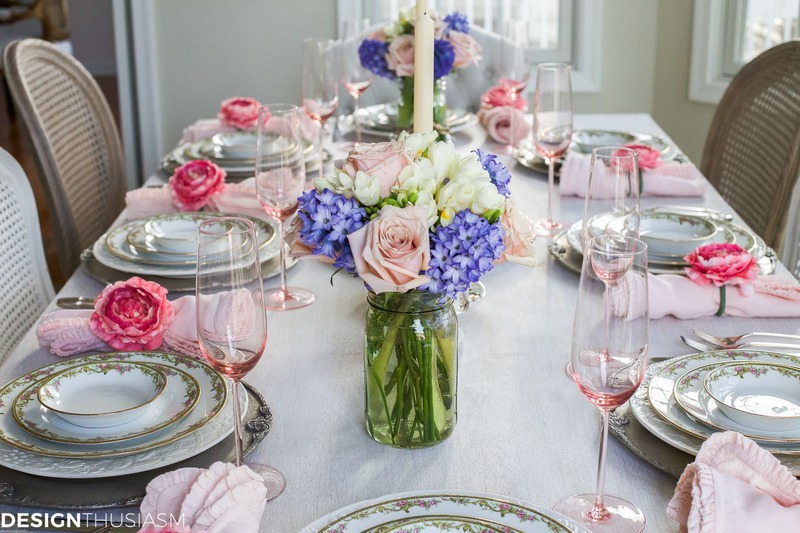 I chose to skip the tablecloth and let the soft colors play off the whitewashed table. Pink champagne flutes really stand out when set against this backdrop. 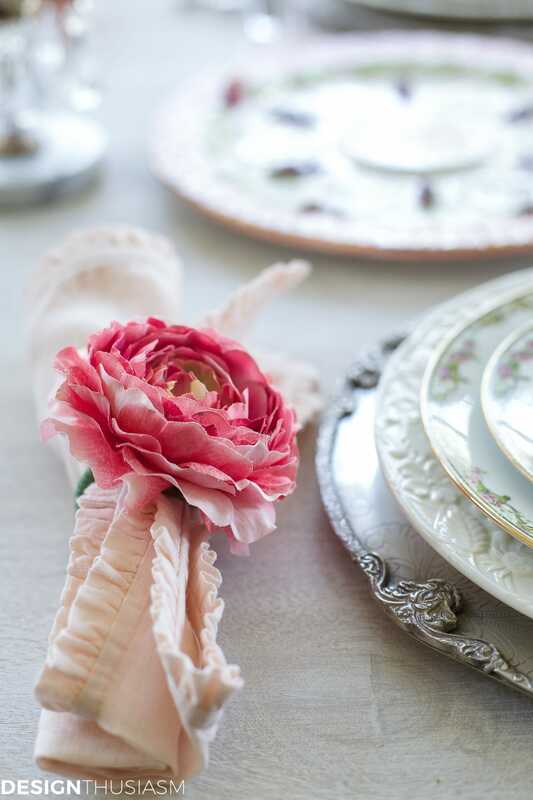 Blush pink linen napkins with a tiny ruffled edge are enhanced by rose-toned floral napkin rings. 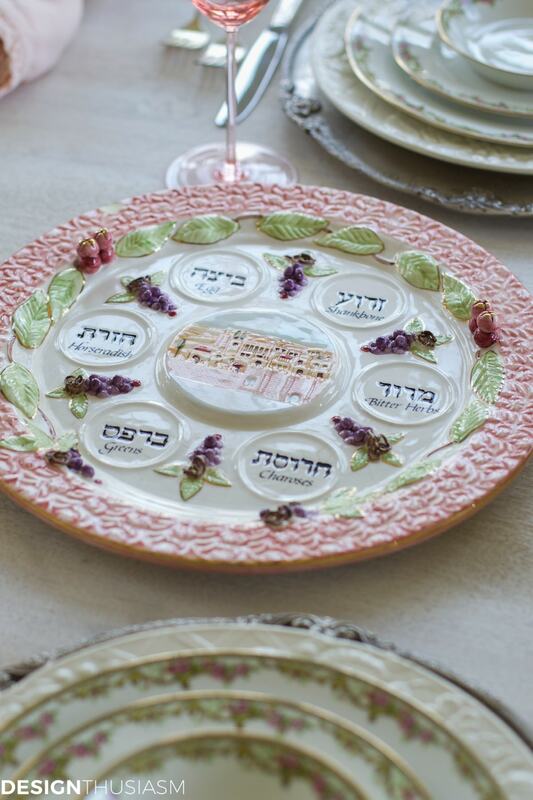 I typically have something taller at the center of my table, but for this holiday, the beautiful seder plate has that position of honor. The hand painted ceramic piece is comprised of wonderful soft pastels and gold highlights. The same affect can be achieved with a serving platter for a different occasion. Vintage crystal and brass candlestick holders add a touch of glimmer to the tableau. As always, I’ve mixed metals on this spring table, using vintage silver flatware for another note of sheen. The piece above is called a kiddish cup, meant for a blessing over wine. It is made by the same artist as the seder plate. 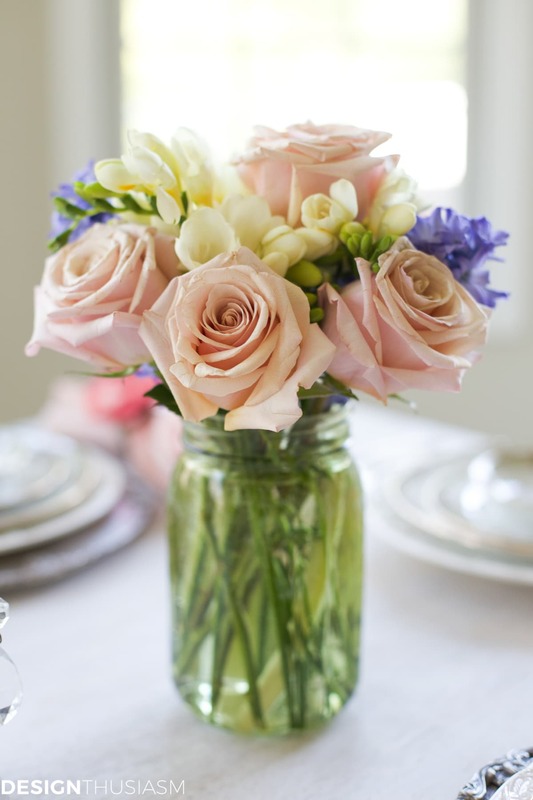 Pale green mason jars hold the graceful spring floral of blush roses, grape hyacinth, and delightful creamy freesia. 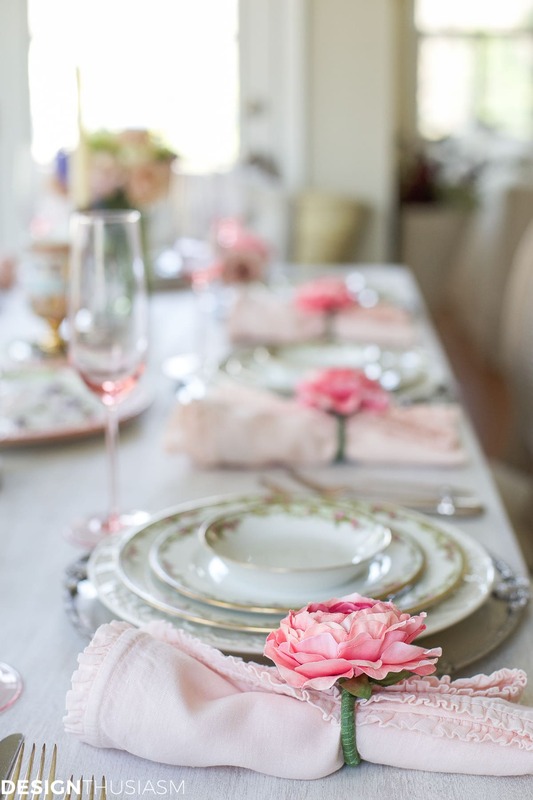 There’s no question in my mind, blush pink is one of the loveliest things you can add to a spring table to make it inviting to your guests. 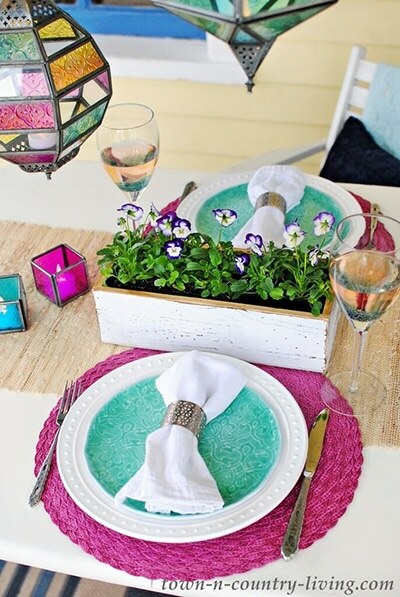 Sprinkle in a few other soft pastels and your table will be golden. 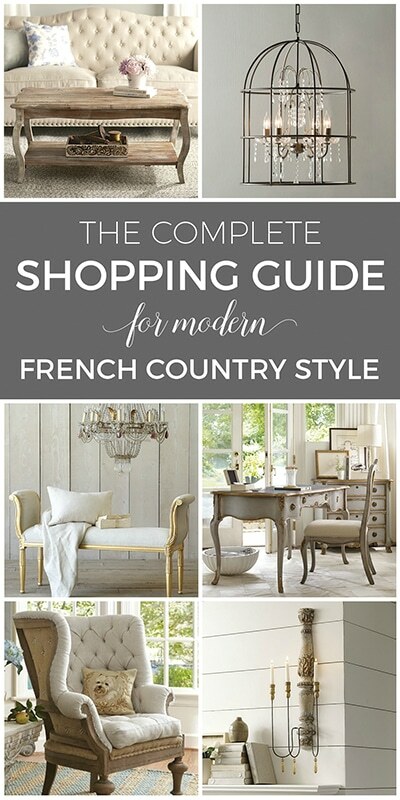 If you start planning now, you’ll be right on time for Mother’s Day. I, on the other hand, will no doubt be late. 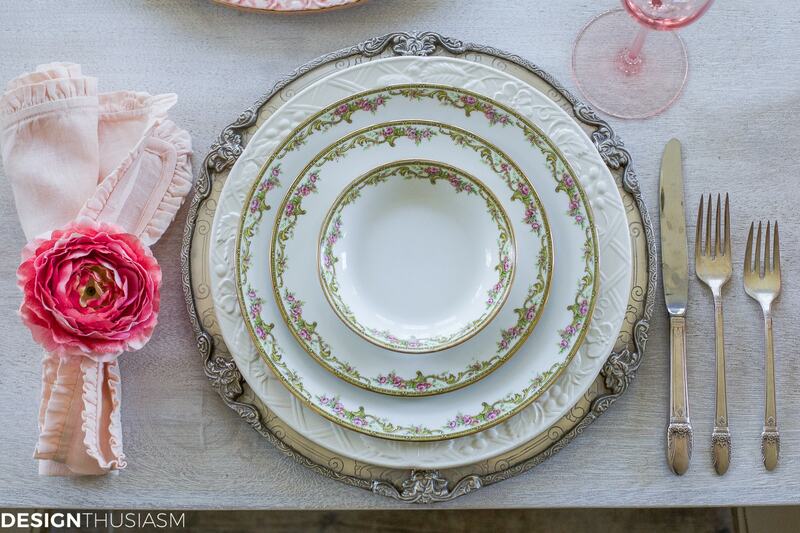 Please take some time to visit the other lovely tablescapes in today’s series. So pretty Lory….and unlike you I don’t use a calendar or spreadsheets. I’m still usually late to the party though! Love those napkin rings btw and it just reminded me that I have some similar stashed away that I need to find around here. Oh yes….not super organized another wonderful/not wonderful trait! Love the Seder plate and kiddish cup! Thanks for sharing that. Going to forward to my Jewish friends for ideas for next time! Hi Lory — Good to know I’m not the only one who is always a little (sometimes even a lot) behind. 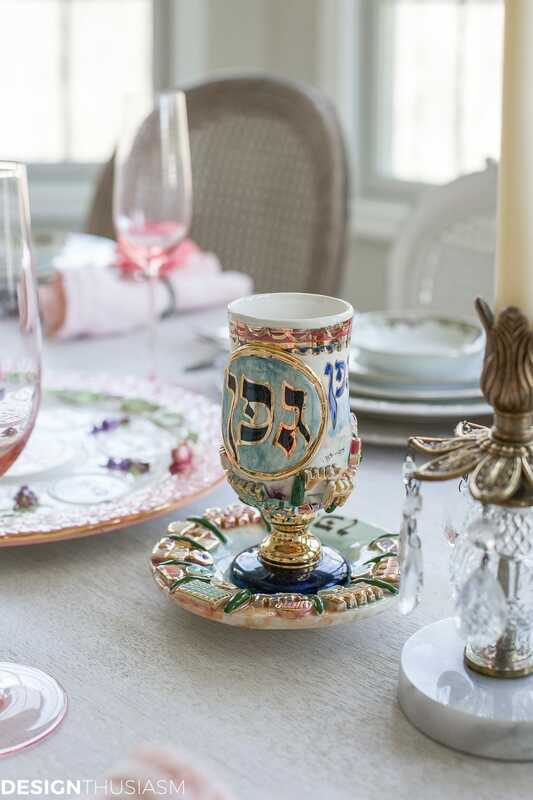 Your Seder plate and cup are beautiful! Thank you for sharing! It’s amazing how you tie everything in. Love your website. 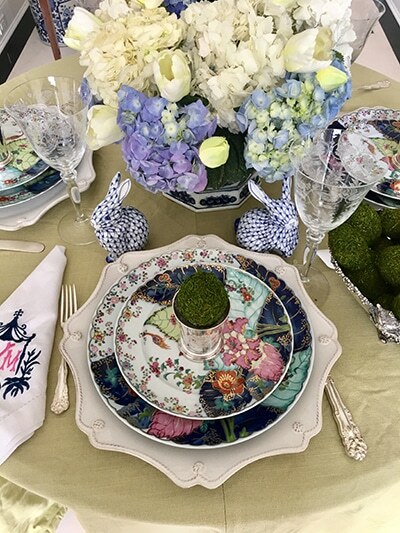 I am 76 years old and have always followed the “traditional” table setting technique. I love the newer mix an match format being used now but am confused as to how you use the stacked dishes. The bottom plate is the charger, then dinner plate, but the other plates confuse me. Would love some help with that. 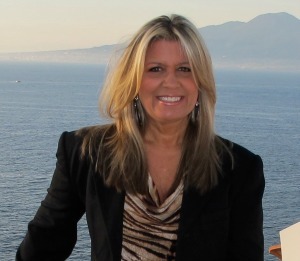 Thank you for bringing so many ideas to your website for us to enjoy. 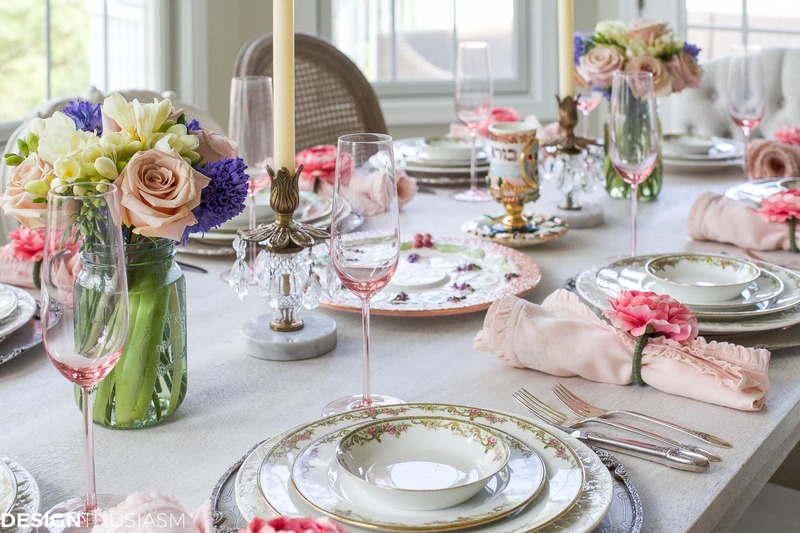 There is nothing I love better than a beautiful table and having ladies for lunch, brunch, etc. Thanks so much, Linda! While occasionally I pile a few more pieces on for the look, most of my tables consist of the charger, dinner plate and salad plate. The charger is there just to catch the spillover from the dinner plate and is not used besides that. So, I usually collect the salad plates when people sit down and hold them aside on the sideboard to be used for dessert. The one exception is if people want to keep them to use for a separate salad plate with dinner. My aunt used to say that she was always a day late and a dollar short. Somedays I feel the same way, especially being a day late. Keeping up with an editorial calendar can be quite a challenge. Those chargers are so unique and work so well with this table. 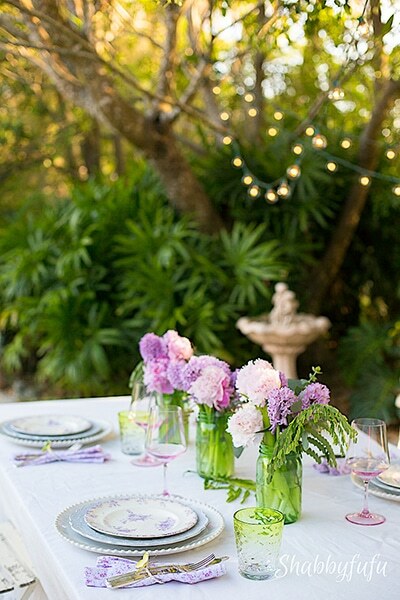 I love the soft elegance that always comes through with your tables. Beautiful work! What a lovely thing to say, Sandra, about my tables… 🙂 Thank you!! Your table is lovely for any season. In some ways it is so very formal yet you’ve played that down by using the Mason jars for the flowers. 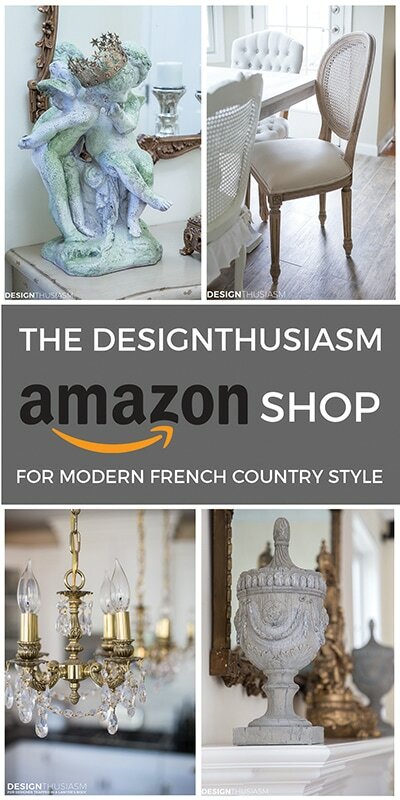 I’m very drawn to the use of eclectic elements.